After their encounter with the Red Hand at the wreck of the HMS Centaurus, the Wardens retreated to their Manhattan headquarters to take in all that they had learned, and carefully read through the serial letters home of the ship’s captain. The ship was led by Lord Reginald Roland Roberts, a fellow of The Royal Society of London for Improving Natural Knowledge. After reading through his increasingly disturbing letters, the Wardens decided their best bet was to meet with a member of the Royal Society. They learned through Sir Arthur Boundless, their Warden mentor, that the Royal Society did not maintain offices in New York. it was entirely possible to telegraph the Warden’s HQ in London and have them make inquiries of the society, but it would take time. He also recalled that there was a society member and peer in New York: Sir Sebastian Styles, a noted archeologist and expert on South American and pre-Columbian cultures. He was currently at the Metropolitan Museum of Art consulting on their upcoming South American exhibit. Evans was happy to introduce the Wardens to Sir Styles. The archeologist was less enthusiastic about meeting them. Barely breaking step while he made his way through the researchers working on the exhibit, he quickly dismissed the Wardens as little more than treasure hunters. Rickard Greystone begged a moment of the archeologists time to examine the crocodile tooth necklace that Father Cameron Dovenney had found in the Amazon. Styles did so, claiming it was unlikely to be a true relic given the apparent newness of its components. Still, he believe that the necklace was likely an invocation of the spirit of the crocodile, meant to grant the wearer increased toughness and vigor. Despite having come to the museum to ask Styles about Lord Roberts, the Wardens never quite got around to do that. Instead they decided to take their leave of the archeologist and made their way to the museum’s exit. Unbeknownst to the Wardens, assassins were waiting for them outside the museum. The gang members lurked in two sedans parked on the street across from the museum’s entrance. As Buchanan went to open the door to his car, the Red Hand detonated a car bomb. The vehicle exploded, sending metal and glass ripping toward the Wardens. The heroes barely evaded the shrapnel and took cover behind neighboring vehicles. A brutal gunfight (with the occasional boomerang thrown by Greystone) followed on the steps of the Metropolitan Museum of Art. Careful shots from a Warden caused the gas tank of one of the Red Hands’ vehicles to rupture and immediately begin burning. The gunfight ended quickly, with no causalities on the Warden side, and one survivor — captured by Greystone — among the attackers. They hastily examined the bodies, all of whom were wearing dark-toned cloths. Their half-dozen attackers were a mix of ethnicities, including individuals they speculated were from China, Ireland, and Italy. The Interview Room at Wardens HQ in Manhattan. Credit: Art Deco Resource. Source. After surviving the gunfight the Wardens once again retired to their HQ, where they immediately withdrew to the “Interview Room” with their prisoner. 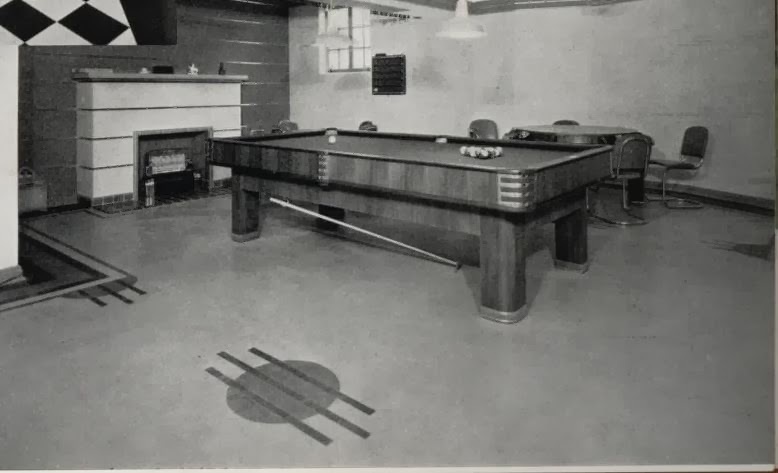 The room was done out in black-and-white art deco tiles, had a fully-functional fireplace, a pool table, and a fully-provisioned wet bar. It also had a central drain in the tile floor. This visibly unnerved the prisoner as he was restrained in heavy-wrought iron chair. The man appeared to be of Chinese origin, and refused to speak when questioned in English. Greystone surprised him by switching to Mandarin Chinese, at which point their prisoner scowled and made some veiled threats of making enemies of the Red Hand. Greystone took this in stride and explained that the Wardens weren’t looking for revenge … just information. He asked why the Red Hands were interested in the HMS Centaurus. Their prisoner, surprised by the congenial tone of his interrogators, decided it was in his best interested to talk. He explained that the Red hands were about achieving enlightenment by traveling the hidden paths to the unseen world. It was a gang that was unlike the other Chinese triads in Chinatown in that they were open to all nationalities and ethnicities. This was told with a sense of true pride. The Red Hand told the Wardens that they had been sent to the wreck of the Centaurus by their leader, Hongqi Pang. He told them to take anything that appeared to be of value. They did exactly that, recovering an ancient and corroded bronze amulet with a blue sapphire heart. They gave it to their master. Learning of this Greystone decided an unexpected response was in order. Rather than storming the Red Hand complex, he asked the Red Hand agent to setup a meeting between the Wardens and Pang. Momentarily stupefied, the Red Hand came to his senses and agreed. Greystone set him free, much to the amusement of the rest of the Wardens. Soon after the “interview” one of HQ’s butlers approached Greystone, just as he and the Wardens were about to relax with a much needed scotch in the Library. “Sir has a visitor,” the butler said. “Lt. Hank McKay, of the New York Police Department. He is here on a matter of some urgency.” Greystone held a random book he’d drawn off the shelf in his hand, his suspicion growing that he’d never get to read the book. Feature photo credit: Wikimedia Commons. Source.